The death of Hajiya Sa’adatu Aliyu popularly known as Barmani Choge was a phenomenal loss to women and to traditional Hausa Music. The death recent of iconic Hausa singer Barmani Choge perhaps marks the end of an era. Not only was her brand of Amada music peculiar, sung in her sultry voice to the accompaniment of calabashes, sometimes inverted in water, but her lyrics were defining. Since her death in Funtua was announced by her son, Alhaji Hamza Aliyu Monday March 4, eulogies have continued to pour in for a woman considered both iconic and in part deviant. For a part of the country shackled in tradition and hemmed in by patriarchy, Barmani’s rise to prominence with her daring music that can be defined as feminist in every sense of the word, and sometimes very racy is a remarkable feat. Often parents would shield their children from listening to her music when she was aired on TV or on radio, especially when she crooned out those salacious lines that women hailed with ululations and cheers and sometimes with bowed heads due to the brazenness of her words and their delivery. But this often increased the young ones’ desire to hear this woman the more. 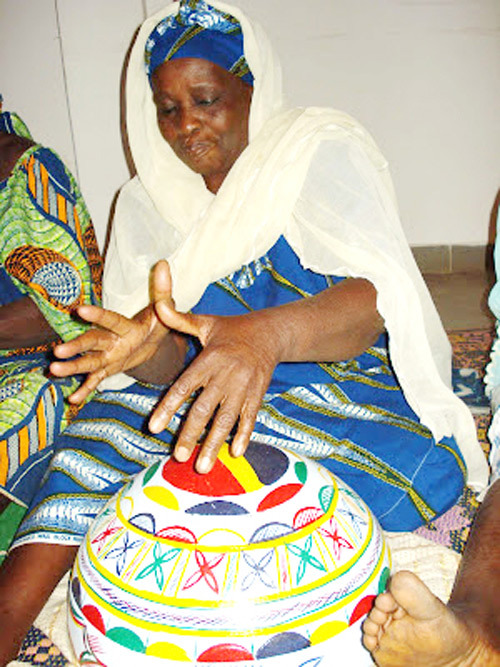 Born in 1943 or 1945, (that has not been definitively established) in the town of Funtua, Barmani soaked up the cosmopolitan nature of that place that produced the legendary Mamman Shata, and she picked up what had hitherto been a pastime for women in the confines of their houses (the beating of calabashes) and made a successful music career out of it. And all these, while having a dozen children or so along the way. A feat she celebrated in her song “Gwanne Ikon Allah”. She reportedly married at 15. The Funtua in which Barmani and Shata grew was teeming with brothels and a joire de vivre approach to life and was perhaps ripe for the lewd lyrics of her hit song “Wakar Duwai wai”, which in contemporary Nigerian music would have taken a fitting title like “The bum bum song”. In it, Barmani praises the female physiognomy and its inherent powers, how a woman can wiggle her backside and have a man do her bidding. Women loved it, and men smiled a silent acknowledgement. And Barmani’s place as a social deviant was firmly established. Some of her lyrics focus on the emancipation of women, economically and otherwise. She is sometimes brutish in her criticism off women who refuse to do anything to improve their economic stations in life. Consider her lyrics in “Ku Kama Sana’a, Mata” (Women, take up a trade) or her unreserved bashing of women who are not as smart as they ought to be and prefer to be reliant on others such as in “Sakarai Bata da Wayo”, (Fool, she’s not smart). But Barmani was not a total rebel and did not encourage social disorder despite the unconventional slant of her lyrics. This despite her opposition to polygamy in her song “Dare Allah Magani”. She sang about childbirth and bragged about her dozen children, split equally between the genders. Of this dozen, she was survived by six and some 60 grandchildren. Her successful career spanned over four decades from when she started singing at 27 and in the tradition of Hausaland acquired a number of wealthy patrons who sponsored her on trips, showered her with gifts of cars, money and other luxury items. She was, for a long while, the sole proprietress of the Amada brand of music, having been preceded by Hajiya Uwaliyo mai Amada, whom Barmani had since outclassed and surpassed in accomplishments. But her star had been in decline for a while, no thanks to the changes in time, globalisation of music, and the influence of contemporary forms of Hausa music a la Kannywood. And at the time of her death, Barmani was not in very good financial standing. She had been ill for some time, reportedly on and off over the last five years, until she was struck down by hypertension that left her paralysed some two months before her death. That according to her son Hamza, who had the grave task of announcing her demise, saying one part of her body had been totally immobile in the last few weeks. With Barmani gone, it would seem the curtain has fallen on an era of traditional Hausa music particularly among women, which she epitomised in all its glory and brazenness and which now yearns for an heir.